Watching the Winter Olympics reminded me that even the best of us fall and what you do when you fall is you get up as quickly as possible and keep going. But sometimes when I fall I like to just lie there. Especially when I fall in snow. 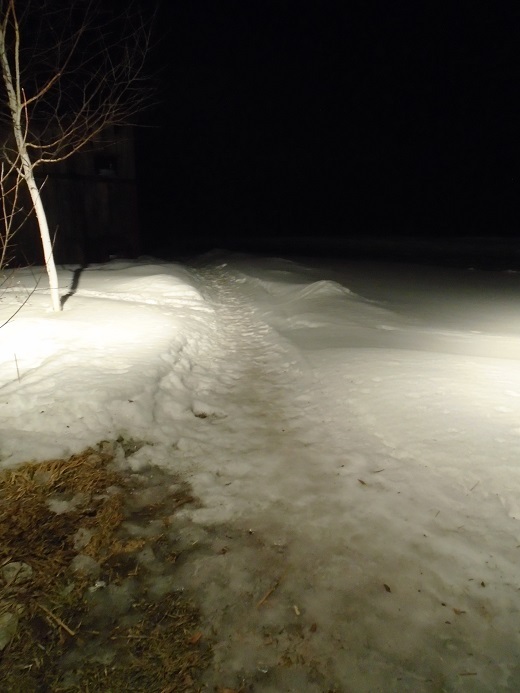 There’s a big snowbank in the yard where the guy who plows my drive pushes all the snow and it piles up into a hill. Sometimes I stand in front of the hill, facing away from it, and I hold my arms out to the side and fall back. That’s a fun thing to do. I’m not sure why, but every time it makes me laugh, and I’m not sure if I’m laughing at the split second of free-fall or laughing upon impact. We are now well into the beginning of the end of winter, which is like sliding downhill with moguls, or something like that, not at all like the luge—it does not go that quick. Rather slow. So maybe like curling—a lot of strategy and sweeping and watching and onlookers wondering, uh, what is going on and when does it end—? But if you know the game, know how it’s played, know its intricacies, it’s fascinating to watch. Every day the snow, the air, the temperature is different. One day it is clear and sunny, near 50 degrees, the snow puckers and shrinks; the next morning it is below zero again and the sky is brittle and the snow is sturdy and hard, a smooth, everlasting, impenetrable sheet; some days the clouds roil and build and bring fresh snow; and, one day, it was more like a rain of some sort with a thin layer of ice forming across the top of the snow. Under the shelter of trees, though, there was no icy crust and the fresh rain-snow was oddly soft and dry. Or so it seemed. A piece of icy snow-rain crust. Days in the 20s and 30s with some sun are perfect. The sun is now traveling high enough in the sky to share its warmth and the snow gleams and smiles, feeling secure, I’m sure, in its invincibility, its coverage complete and deep, but from it little creatures emerge, leaving zipper tracks, and snow and ice slides off the roof and eaves drip. The snow-packed trail to and along the river hardens a bit more each day, and it’s along this trail that I fall. It’s the day of the snow-rain that was so light that I saw nothing in the air. But I could hear it as it pinged off the metal roof, and I could see it as it slid down the roof. 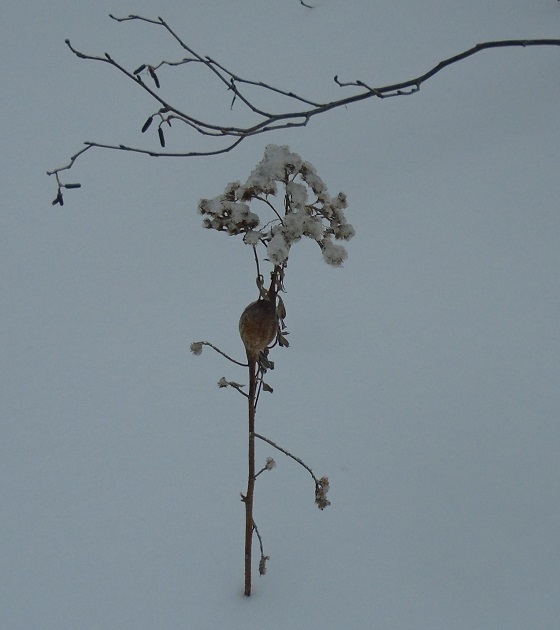 I could see it clinging to thin branches, creating an icy sheath, and I could feel it and hear it cracking underfoot. Small, thin planes of ice also slid off the roof, hit the snowbank below, broke into tiny shards that went skittering off in all directions. A thin plane of ice before the fall. Walking along the river is when I noticed that the snow under the trees did not have this icy crust but was this fresh soft dry stuff that was not powdery but like wet powder—well, I’ve never walked through this kind of snow before. 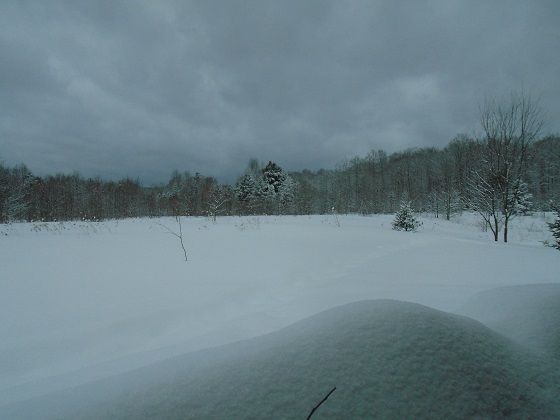 When it’s cold and snowing, snow is dry, light, powdery; when it is warm and snowing, snow is wet, heavy, slushy. Basically. But this snow was heavy and powdery, or maybe light and slushy, a contradiction, anyway, and I kept falling in it. I don’t really know why. 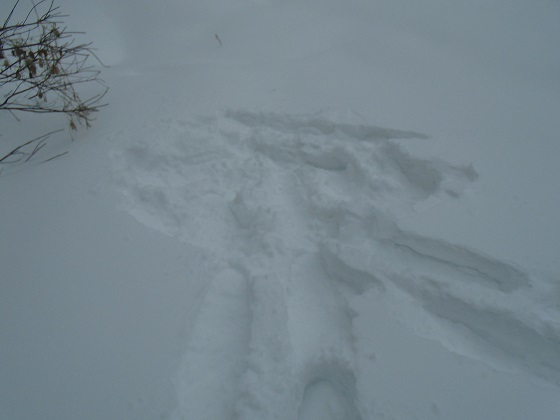 I had on my snowshoes, and every time I fell getting up was a bit of a trick, as it often is in snowshoes because you’ve got to account for those big paddles on the end of your legs, but this day it felt especially tricky. And the falls occurred when, for the most part, I wasn’t doing anything. At one point I had gotten off the trail, walked a few steps over to the prickly cucumber vine laced across a small bush to get a closer look, and while taking a photo I just fell over. Plop. The soft part of the snow was about a foot deep—likely the snow was deeper but you don’t sink all the way down—and it was like tipping over into a big pillow. It was, in a way, extremely pleasant. But my legs were all bent with the snowshoes pinned under me and I had the camera in one hand, and, after pausing a moment for the pleasure of just lying there, it took a bit to maneuver all the parts, to get up, to get out of there. Back on the trail, heading home, I heard the roar of the crowd. Apparently my combined score of 221.3 was good enough for gold. In the Falling While Snapping a Picture of Prickly Cucumber Vine event, an athlete is scored not only on execution but on impression. The crowd rose to its feet and roared. This morning there is more fresh snow. We’ve actually had quite a bit of snow this week of one kind or another. Today looks to be a springlike snow, wet and heavy, a little sassy, a bit arrogant. 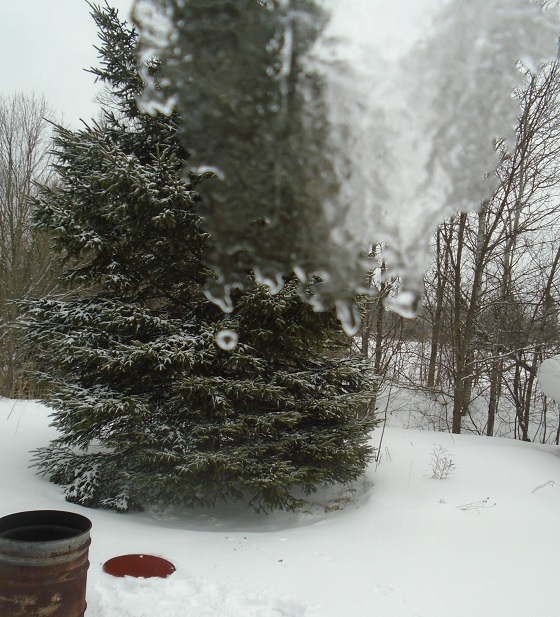 It is not cold out there, but windy, the wind causing the snow to rise up in sweeping curls, twirls and twists, flips and twizzles, jumps and throws. Tomorrow, they say, look for sunshine, light winds, warmer temps. Josie’s last call for business is usually pretty quick, but last night the coyotes were talking. As soon as we stepped out the door onto the porch we heard them preaching their secrets. Josie became alert. Josie listened. Josie moved off the porch onto the frozen snow. He trotted a little this way, he trotted a little that way. His tail was up and rigid. His ears were up, his was nose up. Off to the southwest the coyotes yipped and howled. The coyotes barked. Josie tried to turn to business but could not. Suddenly he howled, he yipped, he barked. Barking and howling he ran down the luge track, our path, heading away from the light to the darkness. I called him back. He stopped and turned. 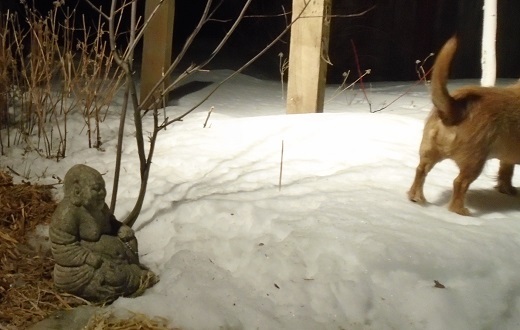 He trotted atop the snow to the well-lit garden. He barked a bit more, howled once again. He lifted his leg, he peed on the Buddha. just the cold at play. but there’s no sign of mouse just cold and outside at three a.m.
I’ve never seen the moon like that. at my side in slumber. The glow of flames dancing on the ceilings on walls. ratcheting up fire steel air. and under the covers Josie breathes sighs stops twitching. 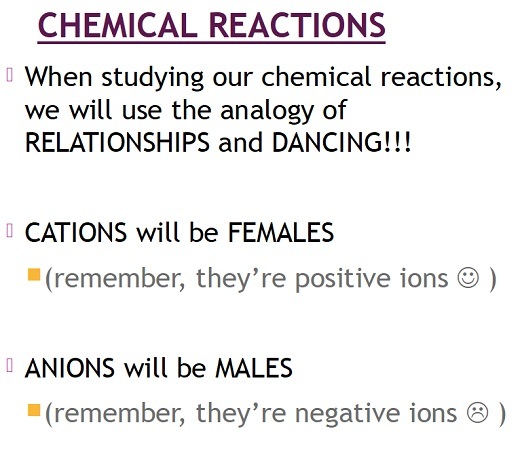 This graphic respectfully stolen from a science class slideshow. 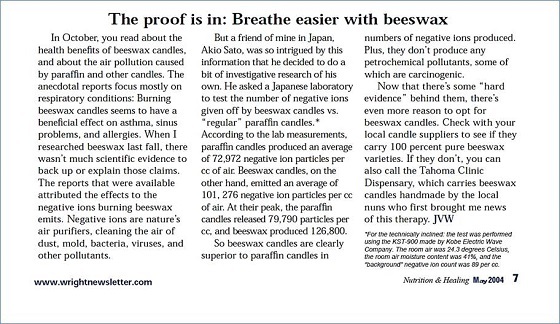 You see, one of the beeswax candle companies I contacted in reference to negative ions got back to me (see Update at end of previous post), steering me toward an article by Dr. Jonathan Wright that refers to a study done in Japan at the behest of a friend of Dr. Wright. Dr. Wright had mentioned to this friend something that beeswax-candle-making nuns had mentioned to him which was, essentially, that beeswax candles emit negative ions that clean the air and therefore beeswax candles are good for asthma and allergy sufferers. Dr. Wright is the founder and director of the Tahoma Clinic near Seattle. I contacted the clinic and was sent this image of the article. According to the article, the study done in Japan showed that both paraffin and beeswax candles emit negative ions while burning. Paraffin emits an average of 72,972 negative ion particles per cc of air while beeswax emits 101,276. So beeswax candles emit 28,304 more negative ions per cc of air than do paraffin candles. Dr. Wright considered this “‘hard evidence’” for promoting beeswax candles as air purifiers, though he did, for some reason, put “hard evidence” in quotes. But if 72,972 negative ion particles have no effect on the surrounding air—for no one is allowing that paraffin candles clean the air to any degree—how can a mere 28,304 negative ion particles have an effect? That is the number that makes the difference between paraffin and beeswax. But how can they make a difference? True, they are 28,304 additional negative ions, but, so what? If the first 72,972 have no effect, what makes the 28,304 additional so effective? It doesn’t make sense to me that 72,972 negative ions are meaningless while 28,304 make all the difference. Unless, of course, you start qualifying the substances from which the negative ions fly, though I am not sure why that would make a difference, and the Japan study did not measure any other emissions from the candles, but, nonetheless, these emissions, whatever they are, do seem to be part of the negative ion equation. Since paraffin is polluting and beeswax is not, beeswax’s negative ions are deemed superior, more efficient, I suppose, to paraffin’s. (In regards to “air pollution caused by paraffin,” Dr. Wright refers us to an earlier article he wrote. The article also tells the story of when he first met the nuns.) But, what if paraffin were not an air pollutant? What if paraffin were, as one candle emissions study concludes, as innocuous as beeswax? * What if paraffin and beeswax's negative ions were compared on an even playing field? Now what are those 28,304 negative ions worth? Why do people insist that it is negative ions that give beeswax its distinct advantage over other candle waxes? Especially when it has been shown that other candles also emit negative ions. I mean, what if, as so many claim, beeswax candles are doing something magical, something special, something no other wax can do? And what if it has nothing to do with negative ions? Everyone stops at “negative ions” as if they are the be all and end all to all that is good. Other possibilities? Not even considered. But what if it’s the pollen? What if it’s that one thing no other wax has? Pollen. Now what paraffin candle can hold a candle to beeswax’s golden, sweet, natural pollen? Meanwhile, I began noticing this statement on several beeswax-promoting, paraffin-bashing websites: “The American Lung Association has warned consumers about the danger of unhealthy air quality from burning paraffin candles.” There are many articles about indoor air quality on the American Lung Association’s website—not one of them warns about paraffin. They do warn about scented candles and other products with added fragrance, as well as many other things. When I contacted the Association to be clear on their views, they responded quickly. [T]hat reference is at least a decade old and, unfortunately, keeps popping up occasionally. We’re sorry for the confusion. We do not draw distinctions between the wax or composition of the candles people use. The big issue isn’t that—it’s the burning of the wick and the particles that produces. Scented products can be problems for people regardless of whether you burn them or not. Our recommendation is to limit use of any candles due to the particles they produce when burning. Regardless of the composition of the candle’s wax, burning candles can add to the fine particles in the air you breathe, some of which you can see in the smoke trails. As for the entomologist and writer, on that note I will have to leave us all hanging. He was being quoted on a lot of websites, too, but when it came time for his close-up, he bugged-out.